The main physiological function of the amino acid L-carnitine is the transfer of long-chain fatty acids to the mitochondria - the cells` "power plant" - for energy production. There are two sources for this amino acid: endogenous - the body`s own production and exogenous - from food. Approximately 75% of the daily amount of L-carnitine comes directly from food, while the body produces the remaining 25% from two essential amino acids - lysine and methionine. The latter process, which takes place in the liver and the kidneys, occurs with participation of different vitamins and minerals, such as vitamin B-3 (niacin), vitamin B-6, vitamin C and iron. Humans produce 0.16-0.48 mg L-carnitine per kg bodyweight per day on average. This fact explains why people with unbalanced diets feel "a lack of energy". The second, exogenous, source is L-carnitine from nutrients. The richest sources of L-carnitine are red meat (50-120 mg per 100 gr. ), poultry, fish and milk and diary products (1.6-6.4 mg per 100 gr.). Tampa (fermented soy) and avocado also contain L-carnitine, although in relatively small quantities. L-carnitine is present in all body tissues, but the highest concentration is found in skeletal muscle (97%), making it very important for proper muscle functioning. Because L-carnitine is rapidly excreted from the body (t1/2 = 17 min. ), regular supply is essential. L-carnitine deficiency results in the production of energy from other sources (mainly carbohydrates), leading to accumulation of undesired products (such as lactic acid in muscles). In addition, the accumulation of fat increases the danger of high serum lipid levels, fatty liver, overweight and other problems resulting from lack of energy on the one hand and excess fat on the other hand. Clinical studies have shown that L-carnitine supplementation may help in improving athletic performance both in professional athletes and amateurs. Aerobic fitness of humans is determined by measuring maximum oxygen consumption. A number of studies have shown that L-carnitine helps to improve the maximum oxygen consumption (VO2max) of weekend warriors and endurance athletes alike. L-carnitine supplementation delays the onse t of fatigue during physical exercise. It is clear that fatigue developmentduring physical exercise significantly reduces physical performance. The two main reasons for fatigue development during physical exercise are accumulation of lactic acid and depletion of glycogen stores (polysaccharide present in skeletal muscle and liver). Clinical studies of athletes undergoing moderate or intensive training demonstrated that taking L-carnitine may diminish lactic acid accumulation. The researchers noted that taking L-carnitine increases fat utilization during physical exercise, thus "saving" glycogen utilization. The result, as mentioned before, is delay in the onse t of fatigue and improvement in the quality of physical performance. L-carnitine supplementation given before intensive training may significantly ease muscle pain resulting from physical exercise and reduce muscle damage after training, thus helping the recovery process after a physical effort. Physical exercise increases the urinary excretion of L-carnitine, lowering its serum concentration (6). L-carnitine consumption prevents this decrease in serum concentration and promotes an unhampered energy supply from lipid sources. The role of L-carnitine in fat metabolism L-carnitine supplementation can be helpful in reducing fat tissue in the body if it is accompanied by a proper diet and the correct, individually adapted, amount of physical exercise. Long-chain fatty acids are metabolized in the mitochondria to produce energy. L-carnitine is vital to this process, because without it, fatty acids cannot penetrate the mitochondrial membrane. After mitochondrial metabolism of the fatty acids and production of energy (ATP), L-carnitine is again needed (in the form of acyl-carnitine) to remove the waste products from the mitochondria.Interactions and safetyL-carnitine is regarded as safe and devoid of adverse effects. Patients suffering from low or borderline thyroid hormone levels should not take L-carnitine since it may impair thyroid hormone activity. Carnitine also appears as D-carnitine. This form causes many adverse effects and is not recommended for use. Only the active and safe compound L-carnitine should be used. Instructions: 1-3 tablets per day on an empty stomach. Should be used approximately 2 hours before the beginning of physical exercise. 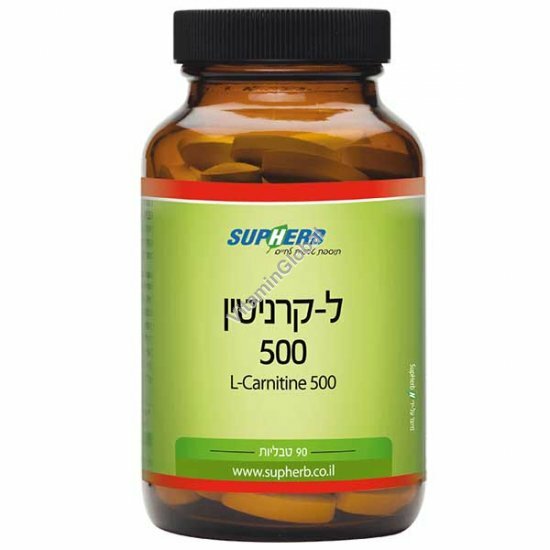 L-Carnitine from the SupHerb Sport series is available in packages of 90 tablets.